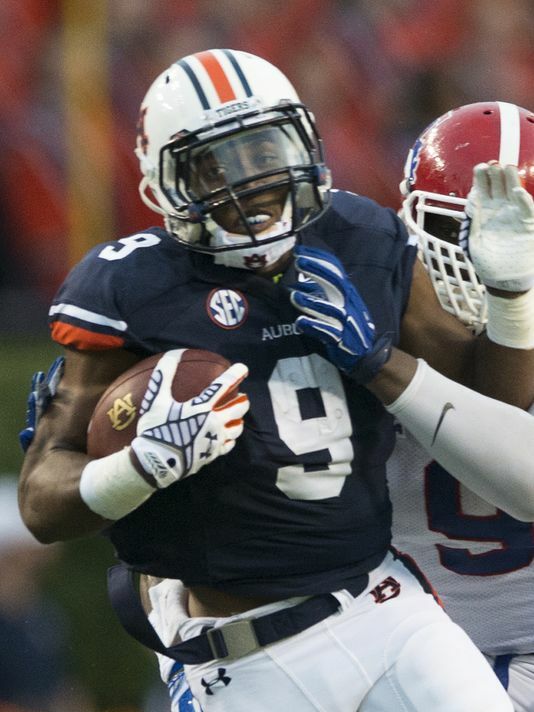 How do you follow up a magical and improbable 2013-2014 in Auburn? A hot start seemed to indicate the Tigers were still very much in the championship hunt, but the team cooled off considerably in the season's second half. They would finish up 8-5, following a tough and exciting Iron Bowl loss to Alabama and a heartbreaker to Wisconsin in the Outback Bowl. While eight wins wasn't exactly the Hollywood sequel many Auburn fans would have hoped for, it was an overall successful season for second year coach Gus Malzahn and the Tigers, showing that they could win big games and that '13-'14 was no fluke. Entering 2015 though, this particular Auburn team has all the pieces to get back to a National Championship game, after it eluded them last year. 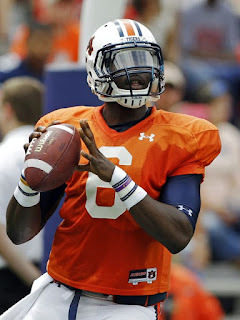 The loss of Nick Marshall at quarterback might not be a loss at all, as backup Jeremy Johnson has a ton of hype around him, and the defense should be majorly improved with the addition of former Florida head coach Will Muschamp at defensive coordinator. A program that has struggled with any type of consistency (in the past decade the Tigers have had five years of at least 11 wins and five years of five or more losses), Auburn will be eager to prove that they have staying power in the national scene under Malzahn, and this would be the year to do it. pass the ball a lot more most likely, but the ground game should still play a major role, as it has throughout Malzahn's head coaching career. Unfortunately, reliable tailback Cameron Artis-Payne graduated, taking his 1,608 yards and 13 touchdowns with him. To make matters worse, speedy Corey Grant also exhausted his eligibility, meaning that joined with the loss of Marshall, Auburn is without their top three rushers from last season. That should put even more pressure on the aerial attack, and a lot more on sophomore Roc Thomas. The hyped-interstate recruit did not disappoint in his Auburn debut last season. He ran for 214 yards and two scores in very limited action, and much bigger things are expected of him this season. Thomas has the speed and shiftiness to become a big play threat and also possesses the vision to get solid yardage every time he touches the ball. If the Tigers are looking for a change of pace, expect junior college transfer Jovon Robinson to get some action. Robinson is much more powerful than Thomas and would pose a serious threat as a runner in the red zone or in short yardage. Robinson was absolutely dominant in the JUCO ranks while at Georgia Military College and while the SEC is certainly a major step up, he should still be very productive. Speedy quick sophomore Peyton Barber is another Tiger that should search for some carries, and big things are going to be expected of newcomer Kerryon Johnson. Johnson is rated by some as a five-star pickup by Malzahn and staff and he should play multiple positions. But, he is most natural at back and co-offensive coordinators Rhett Lashlee and Dameyune Craig will be creative in getting him the ball. Receivers: Go-to receivers haven't exactly been a very common theme in Auburn throughout the years. There hasn't been a lack of talent, but there hasn't ever really been that star at receiver for the Tigers for a pretty long time. That shouldn't be a problem this year; senior D'Haquille "Duke" Williams is easily the team's top target this season, especially with the loss of Sammie Coates. Williams was yet another junior college pickup for Malzahn who was absolutely wonderful in his first year with the Tigers in 2014-2015, with 45 receptions for 730 yards and five touchdowns. Perhaps what is most impressive about those numbers is that he was doing it against double teams and coverage packages specifically set up to stop him. Everybody knew that Auburn was going to go to Williams on obvious passing situations and he still managed to put up great numbers. The senior has a long and athletic frame that is so tough to cover. His size and explosiveness have made him a very appealing NFL Draft prospect and it will be interesting to see how much his stock may increase with Auburn putting more time into the passing game. Though, Williams has had a long offseason. Williams never played in the Outback Bowl loss due to off-field issues and there has been friction between him, Malzahn and receivers coach Dameyune Craig all offseason. In fact, in spring, Williams let out a string of tweets indicating a possible transfer. But, all the excitement and mystery has died down; Williams is going to stay in Auburn and likely play a huge role in a team that is going to be in prime position for a Playoff berth. Williams will be joined in Auburn's receiver corps by seniors Melvin Ray and Ricardo Louis. Both Ray and Louis have made one thing clear in their time with the Tigers: they are huge big play threats. Ray had just eight catches all of last season put still managed 182 yards, meaning he averaged nearly 23 yards per reception. Meanwhile, Louis had 21 catches for 261 yards and three touchdowns. Louis has been productive throughout his career with the Tigers but will most likely be remembered most for one play. His miraculous catch in the "Prayer at Jordan-Hare" helped Auburn pull off an unreal victory against Georgia in the 2013 season kept Auburn's national title aspirations alive. Clearly, his speed and hands are exceptional, but he is still learning to grow as a route runner. Also returning is junior Marcus Davis, a solid receiver with reliable hands who had 13 receptions a year ago. Little used Tony Stevens is going to be in store for a major improvement; at 6'4", 200 pounds he can make some athletic plays over smaller defenders but will need time to adjust to an increased role. The tight end position is bound to be very interesting after the graduation of productive C.J. Uzomah. True freshman Chandler Cox arrives from Florida with a decent chance to start, but he will be pushed by young Chris Laye, a redshirt freshman. Offensive Line: Auburn's offensive line has been a vastly underrated unit the past few years, as it has proven to be one of the conference's better O-Lines. It has had to be, to make Gus Malzahn's read-option heavy offensive attack work. There are some losses throughout the unit, including All-American center Reese Dismukes, but it should still be solid. Left tackle Shon Coleman is going to be a stud this season. Coleman played often last season and proved to be a very productive weapon at the tackle position. Coleman has great size, footwork and long, powerful arms that allow him to gain separation from opposing pass rushers. Joining Coleman as a returning starter on the offensive line is going to be junior Avery Young who will start at the other tackle position on the right side. Despite not being the flashiest linemen, Young is another productive veteran with great power and decent mobility. Those two should give Auburn two very experienced players on the perimeter, and they will certainly help out Johnson quite a bit. The interior of the unit is a little bit more of a question, but there is no denying the talent there. Junior Austin Golson is slated to take center duties from Dismukes, but there shouldn't be a major dropoff at the position. Golson was a pretty major piece of Ole Miss' infamous 2013 recruiting class, though he was overshadowed because the Rebels also managed Laremy Tunsil on the offensive line and some crazy talent elsewhere. Golson was probably going to develop into something great in Oxford, but he transferred to Auburn last year to be closer to family. He did not receive a waiver, meaning that he had to sit out all year. While he probably would have loved to play, that wasn't a terrible thing for the Tigers. Golson got to work behind Dismukes and also form relationships with the team before he was thrown into the brutal trenches of SEC play. Joining Golson in the heart of the offensive line will be two talented guards. Junior Alex Kozan is a great run blocker who should pave huge holes for Thomas, Robinson and more. The 300-pounder has worked hard to add even more bulk, so that he can use that power against some of the massive SEC defenders. On the other side, sophomore Braden Smith is going to take over the position, replacing solid Chad Slade. Smith has seen some action with Auburn, but not a ton. He will need some adjustment time, but the youthful sophomore has all the tools to be a very good linemen. True freshman Bailey Sharp arrives from Georgia as a pretty coveted offensive tackle who received a four-star grade. Another Georgia find, Kaleb Kim is a strong and physical guard who should fit into the Auburn offensive line in no time. Defensive Line: Will Muschamp is a great defensive mind and he will dial up a number of different schemes to get this front seven after the quarterback. The Tigers should run a base 4-3, but Muschamp will also be certain to work on some 3-4 and more dynamic looks. Perhaps the top pass rusher on this Auburn roster didn't even play a single snap last season. Carl Lawson was a pretty key defensive member of the 2013-2014 team as a true freshman but a torn ACL in spring practice knocked him out of the entire 2014 season. The junior is now apparently healthy, and he will give this Auburn defense a major boost. Lawson, a former Freshman All-American during that 2013 campaign, recorded four sacks. That is a relatively modest number, but he has bulked up even more, gotten stronger and worked harder on becoming a more natural pass rusher off the edge. Lawson could legitimately record double digit sacks this season if that knee holds up. The other defensive end spot is going to be manned by returning senior DeVonte Lambert. The veteran wasn't exactly a superstar last season for the Tigers but he did show that he could get in the quarterbacks' eyes and him make uncomfortable, with 10 quarterback hurries a season ago. Along with Lambert at defensive end will be juniors Elijah Daniel and Gimel President. Daniel is a solid run defender who had 15 tackles ad 3.5 tackles for loss in a reserve role last season. President is probably known more for his interesting name than his defensive prowess at this point, but he has the size and ferocity to grow into a pretty imposing end this season. Also likely to see snaps at end is going to be the gem of the 2015 recruiting class for the Tigers, consensus five-star recruit Byron Cowart. Formerly a Florida commit, Cowart decided to head further West to Auburn, following Muschamp from Gainesville to rural Alabama. The true freshman is quite frankly a freak; he is 6'3", 280 pounds of pure muscle with fabulous athleticism and an incredibly high motor. Even though he is definitely very young, he could still find a niche on this Auburn squad. The losses on the unit come in the interior, where three solid defensive tackles: Gabe Wright, Angelo Blackson and Ben Bradley all depart. Wright was perhaps the best of the trio, after he had 24 tackles with 4.5 of them going for a loss in 2014-2015. Junior Montravious Adams saw healthy dose of snaps last season and proved to be deceptively athletic for his size. He can use that athleticism to get after the quarterback, and he sure to wreak plenty of havoc this season. Starting alongside Adams is well, a question right now. Junior Devaroe Lawrence knows the Auburn way but he is still inexperienced in Muschamp's system and hasn't seen much action with the Tigers. Redshirt freshman Dontavious Russell has loads of potential but is also unproven. Perhaps junior college transfer Maurice Swain, who arrives from Mississippi Gulf Coast CC could see a starting gig right away. Linebackers: Probably the group with the biggest transition from former defensive coordinator Ellis Johnson to Muschamp is going to the linebacker corps. It will switch from two starters, one in the "Star" position to a 4-3 look for the most part. It will be interesting to see the transition for the unit, but the good news is that talent oozes from the unit. It begins with senior middle linebacker Cassanova McKinzy, a versatile playmaker. McKinzy just loves to hit opponents, and he has done it a few times, with 166 total tackles over the past two years, easily leading the team. McKinzy is blessed with great instincts and fabulous closing speed, allowing him to make all those tackles. A playmaker like McKinzy who is very reliable in the middle is so huge to the Auburn defense. Not only does it give them major help in run support, but it also enables the Tigers' outside 'backers to get after the quarterback, knowing they have safety beyond them in McKinzy. A prime example of this is senior Kris Frost, who has grown into a formidable pass rusher for Auburn. Frost started all 13 games for the Tigers last year, and had 3.5 sacks along with 10 tackles for loss. An experienced senior, Frost knows how to not only get after the quarterback, but make important tackles for the Tigers. Frost and McKinzy alone make this unit a strength for Auburn, which is a good thing considering the third starting linebacker slot is a question mark right now. Sophomore Tre' Williams certainly has a ton of talent but has had some ups-and-downs in his short collegiate career. Malzahn and staff made sure there were reinforcements coming in at the outside linebacker spot though. He landed a number of different linebackers, all who could see immediate action. Jacksonville product Jeffery Holland is probably the best of the group. A four-star who put up gaudy numbers while at Trinity Christian Academy, Holland has all the tools to play right away. Richard McBryde is a local prospect from Alabama with an excellent motor and plenty of upside, while Jordan Colbert arrives from Griffin, Georgia with plenty of hype himself. Those three will fight with junior Ja'Viere Mitchell and Williams for the starting job. Solid senior Justin Garrett also returns to the unit, and will search to make an impact in a backup role at any number of positions. Secondary: Auburn fans and the coaching staff are likely looking for major improvements from the secondary and pass defense. Although it wasn't absolutely terrible last season, the pass defense was far from good, and it cost the Tigers in some big games. Muschamp will work hard to instill discipline on the unit, and it will definitely be a major help that there is some significant talent returning, plus an impact transfer. Cornerback Jonathan Jones is hoping to follow up on an All-SEC 2014-2015, something he could certainly do, especially if he picks off as much passes as he did a year ago. Jones proved that he was wonderful at reading quarterbacks eyes and making plays, with a very impressive six interceptions last year. The next part: growing into a more consistent contributor and also making plays off of those interceptions (he only had six return yards from those turnovers). Also joining Jones in the defensive backfield is going to be junior Jonathan Ford, who actually led the Tigers in tackles last season. Ford finished up with 93 (McKinzy finished up with 91), with 62 of them coming solo. He is a fantastic tackler, who uses incredible quickness to get to the right spot and make the right play. He will return to the strong safety position, and along with Jones will play an important leadership role in a unit vital to Auburn's success. The big addition to the unit this season has to be Georgia transfer Tray Matthews. Matthews has a very interesting story: he was the Bulldog who misplayed Marshall's Hail Mary in the "Prayer at Jordan-Hare" causing the ball to take a weird skirt to Ricardo Louis, who won the game for Auburn. He joined in on the transferring wave away from Georgia last offseason and now will get a chance to suit up for Auburn. A well-built safety with great play recognition, Matthews will definitely be a major help. And, now he will be able to actually help Auburn pull off some miracles without causing his team a loss. Rounding out the unit will be the cornerback opposite of Jones, in senior Joshua Holsey. Holsey is a proven run stopper, who recorded 41 tackles last season. He doesn't have the playmaking ability of Jones or the ball skills, but he has proven more than useful for Auburn. Holsey also has plenty of versatility, as he could spend time at safety if the Tigers need him to do. Junior T.J. Davis is a playmaking cornerback who should see plenty of snaps behind Holsey and Jones, while there is a solid amount of depth throughout the secondary as a whole. Special Teams: Sophomore Daniel Carlson returns to Auburn and will once more play a critical role, as he will handle both punting and kicking duties once more. He showed plenty of talent, knocking down 18 of 24 field goals, and having a punting average of 42 yards. Ricardo Louis will be relied on to take over a much larger role in the return game. It honestly is a pretty crazy thought; Auburn will lose their quarterback and top rusher from a team that went 8-5 and ended the year on a sour note and still are widely seen as the top team in the entire SEC. So much of it relies on the arm of Johnson. Cam Newton comparisons should be flattering, but they are unfair. Though, the junior should be as good as advertised, and will be helped out by Williams and a stellar offensive line. Though, perhaps what will most help Auburn contend is the defense. There is incredible talent, depth and experience from top to bottom, with big names ready to star such as McKinzy, Lawson, Jones and much more. If Muschamp can recreate some of the defenses he had at Texas and in his earlier Florida days, the Tigers will be just plain nasty. Life will certainly not be easy for Auburn in the unforgiving SEC West, especially with a tough November that includes meetings with Alabama and Georgia (at least they are at home), plus a non-conference opener against Louisville in Atlanta. But, this Auburn team has all the tools to return to the spotlights of a Playoff and a National Championship game, and create some more magic when they get there.